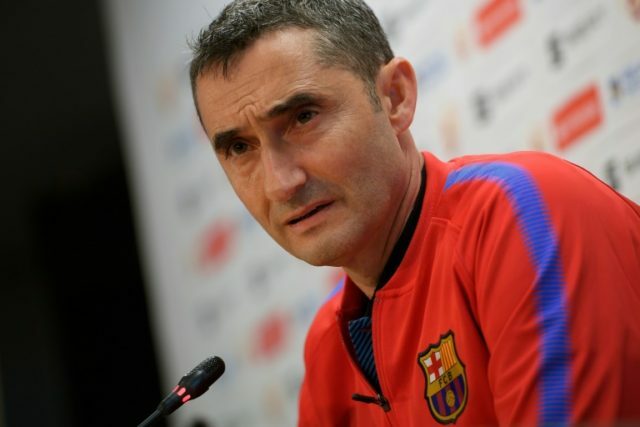 Barcelona (AFP) – Barcelona coach Ernesto Valverde knows victory in Saturday’s Copa del Rey final against Sevilla would go some small way towards making up for the disappointment of their recent Champions League exit. “After a big defeat we want a big victory. We have the opportunity to put that little disappointment behind us,” Valverde said at a press conference on the eve of the game, which will be played at Atletico Madrid’s Wanda Metropolitano stadium. Barca are hoping to lift one piece of silverware this weekend before going on to secure the Spanish league title — they can still complete the entire La Liga season unbeaten. But their domestic success so far this season has been overshadowed by the nature of their Champions League exit. They lost to Roma in the quarter-finals on away goals, capitulating 3-0 in Italy after a 4-1 win at home in the first leg. Barcelona have won the Copa del Rey in each of the last three seasons, including defeating Sevilla 2-0 after extra-time in Madrid in 2016. “It would be something significant for the club because they have won this final in recent years and it is not an easy thing to do,” said Valverde. The last team to win the Cup four seasons running was Athletic Bilbao in the early 1930s. A victory for the Catalans would set them up nicely for their next La Liga outing, when a victory at Deportivo La Coruna would secure the title. That is if they are not crowned champions on Sunday, which will be the case if Betis win away to Atletico. “In La Liga we have five ‘match balls’ left and we just need to take one of them, but we will try to do it as soon as possible,” added Valverde, although he had a warning for his side ahead of Saturday’s final.